High quality optics do not need to cost a fortune. The proof is found in Richter Optik scopes. Field of view @100yds ~ 17.8ft. The mounts have 10mm elevation. Field of view @100yds ~ 30.3ft. 10 aiming points on the elevation and 9 on the windage. Scope mounts need min 9mm elevation. Field of view @100yds ~ 28.82ft. 11 aiming points on the elevation and 11 on the windage. Scope mounts need min 13mm elevation. just add ' £5 off mounts ' to text box above. Offer doesn't apply to the 4x20 scope. or these ~ double clamped scope mounts for weaver / picatinny rails. 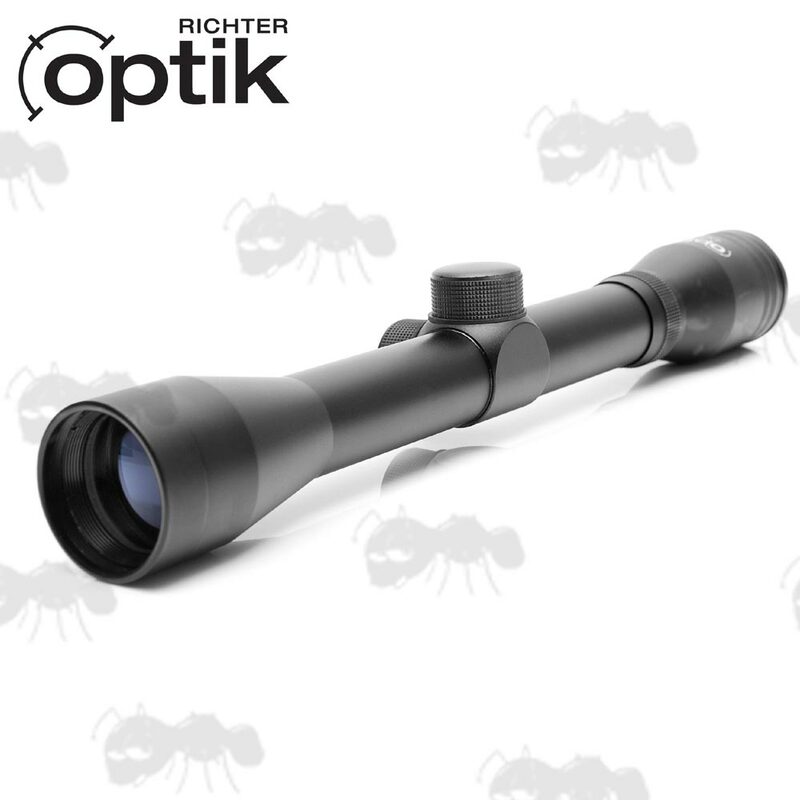 The Crystal Range: Richter Crystal Range of fixed magnification scopes are a range of no-frills, simple rifle scopes that offer superb optical quality to provide clear, crisp and bright images. They are excellent for fast target acquisition thanks to their extra-large field of view. Each with free flip-up* scope covers. Mounts are not included, but available separately. ¼ MOA windage and elevation adjustments. 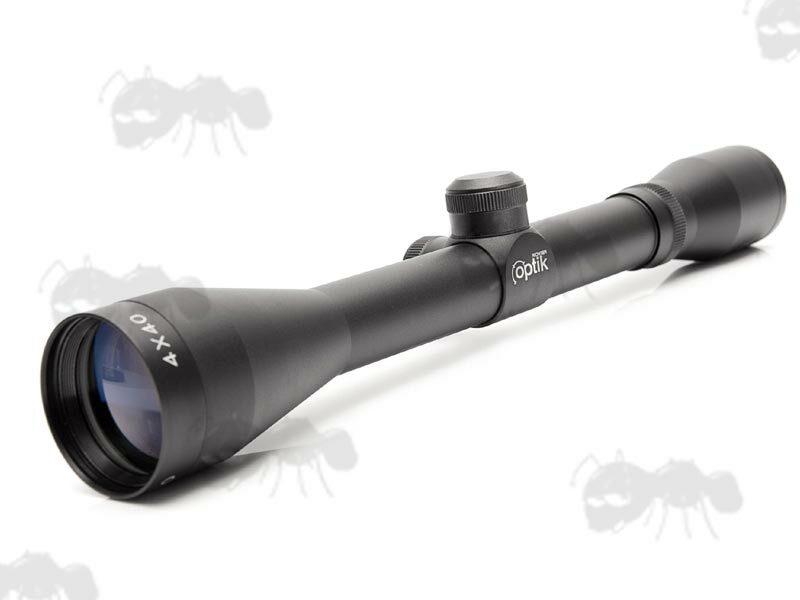 *The 4x20 model has standard crosshairs; Comes with push fit lens covers and dovetail mounts are included and fitted. It can be fitted with weaver / picatinny rail mounts but you would have to dismantle the scope in order to remove the dovetail mounts, as the design of them means they need to slide off. Link to our ~ 19mm diameter vertical split weaver / picatinny rail scope mounts. For an easier option you could just use these ~ weaver / picatinny rail to dovetail adapters. An alternative to the push cap lens caps are these ~ Size 1 Quake Bushwacker lens covers. 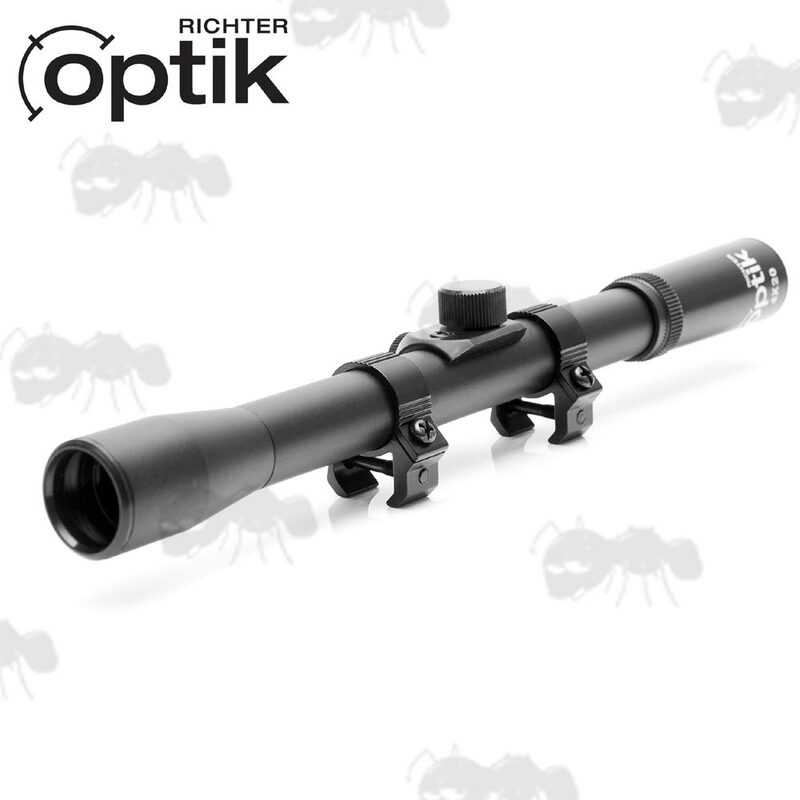 Richter Scopes offer top quality optics at extremely reasonable prices. Clear, crisp imagery and strong build quality does not need to cost the earth. 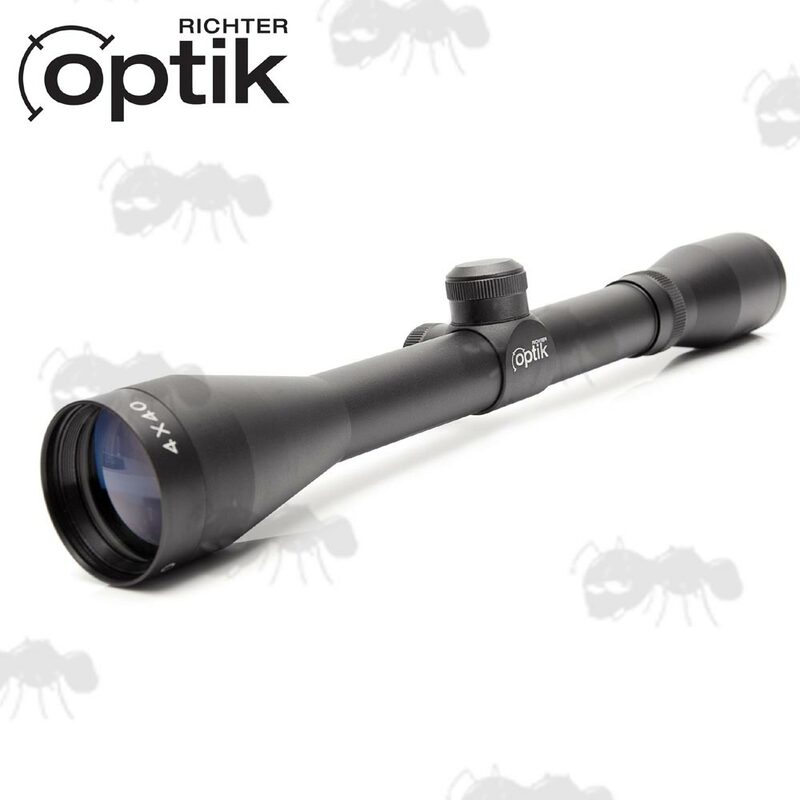 Richter Scopes are partly designed in Germany, then made in China by a specialist optical and electrical manufacturer, using the latest and most advanced CNC equipment available. The factory strives for excellence through continuous product research and development, adopting advanced optics technologies and offering a professional service. The professional manufacturing team consists of over 500 employees including designers, technicians and engineers with decades of experience. The team was awarded the ISO9001:2000 UK Certificate in 2001, ensuring the success of their engineering development. 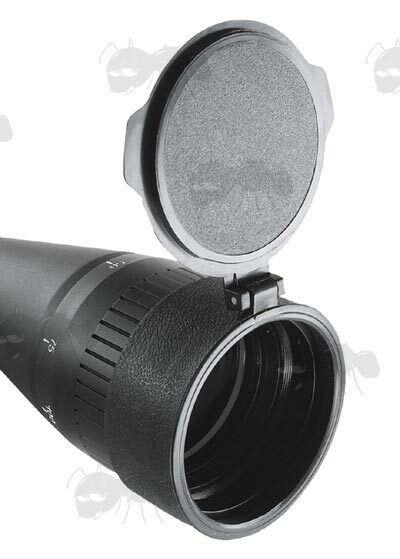 Each scope (except the 4x20mm) comes with a pair of black flip-up lens covers.